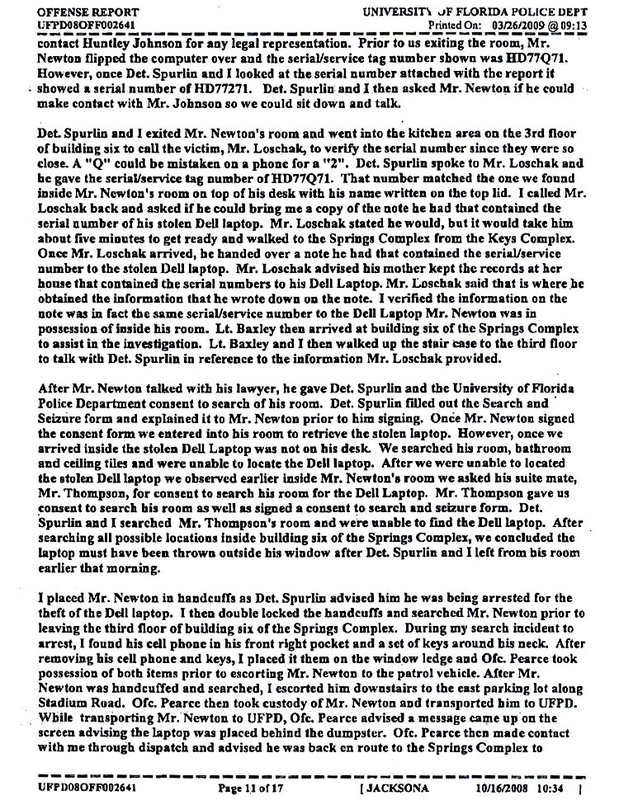 NOVEMBER 9--Two years ago--before all the Heisman Trophy talk and the stories about cash solicitations and alleged academic misconduct--Cameron Newton was copping to possessing a computer that was stolen from a fellow University of Florida student. 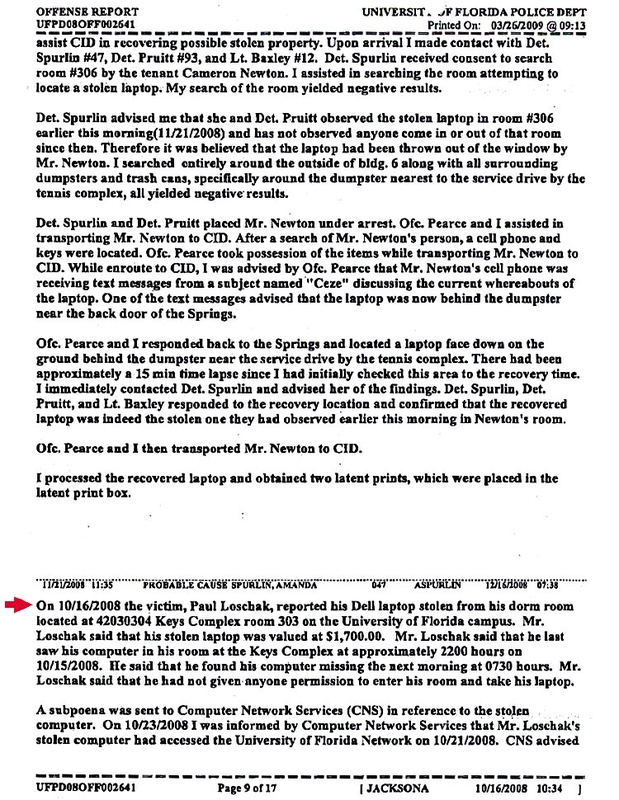 Newton, now the star quarterback at second-ranked Auburn University, was arrested in November 2008 and charged with grand theft, burglary, and obstructing justice in connection with the boosting of Paul Loschak’s Dell laptop. 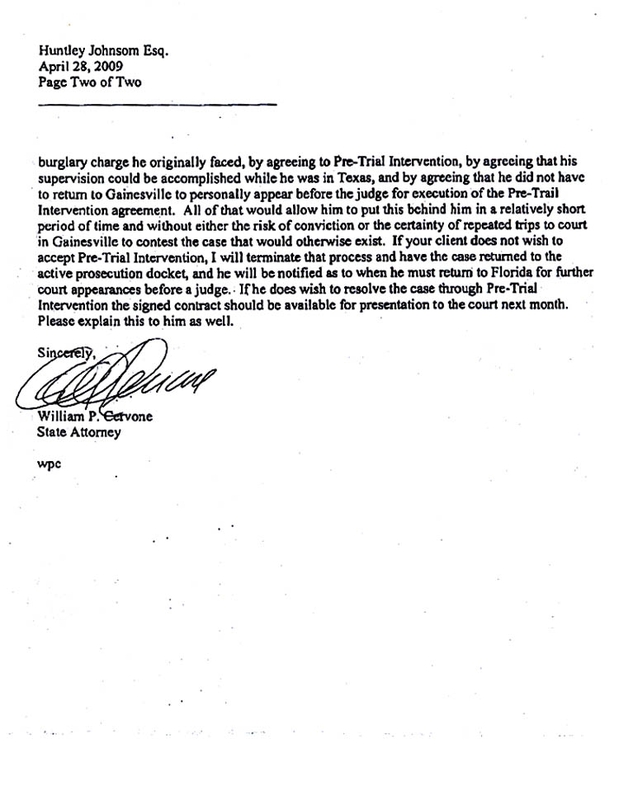 After Newton, now 21, admitted being in possession of the hot computer, he was placed into a pre-trial intervention program that ended last December with all charges against him being dropped. 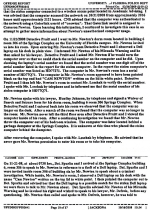 A University of Florida Police Department report, excerpted here, details how investigators tracked the stolen laptop to the athlete, and how Newton tossed the computer out his dorm window in a humorously ill-advised attempt to hide it from cops (a friend scooped up the laptop and hid it behind a dumpster at a nearby school building). 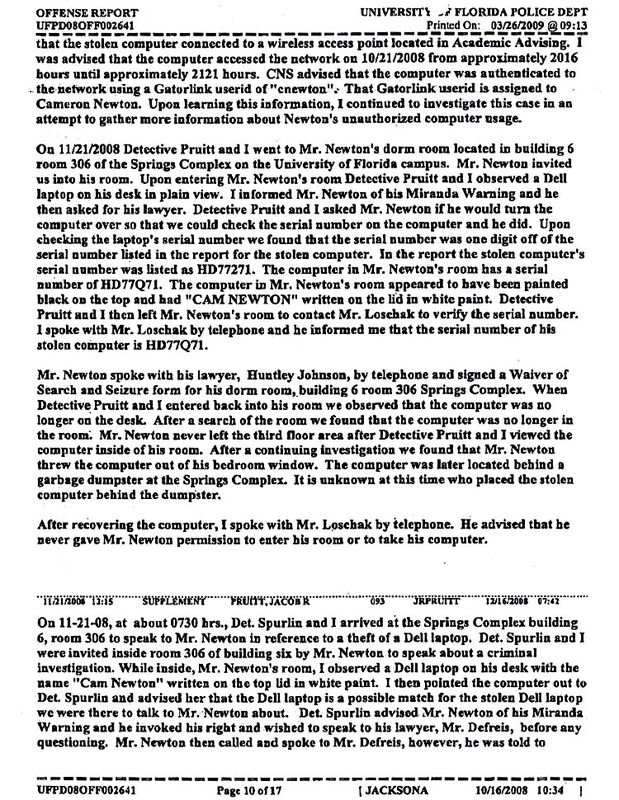 As cops were about to search his room, Newton (then a backup to Florida QB Tim Tebow) was overheard on a cell phone telling someone, “There was a computer and I took it.” After noting that he had thrown the laptop out of the window, Newton remarked, “Huh! 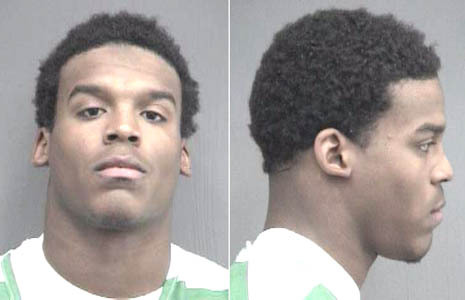 Cuz, they 'bout to search my room.” The football star is pictured in the above mug shot. Submitted by DJJayito on Tue, 2010-11-16 15:59. The GREATEST THING going on in football these days is that fact that Mike Vick has gotten his life in order. He made mistakes (LOTS OF THEM), but he did his time and now he's CLEARLY a better person, because of it. He's far more focused than ever before. Instead of being Last In / First Out at practice, he is first to arrive and last to leave. Someone like Cam Newton - who's currently making mistakes (perhaps) can LEARN from Vick's experience and get his life in order - BEFORE the pros. Submitted by Essen Sie Micht on Thu, 2010-11-11 02:12. This guy, Vick, Kobe, Woods - all these douchebags seem to have something in common - but I can't quite put my finger on it. Submitted by Acacia59 on Fri, 2010-11-12 09:59. I think you mean that they are all stupid. Submitted by Redoubt on Wed, 2010-11-10 22:40. So far as I am aware, Newton has neither been charged or convicted of any crime. In fact, my guess is that a closer look would reveal that many if not most of the allegations are adversary-generated from boosters and alum of other schools. Beyond that, under the hood the whole thing is being powered by ESPN and the sports media who are profiting from the Newton feeding frenzy. But that IS the kind of society we have become. Guilty until proven more guilty. Submitted by Acacia59 on Fri, 2010-11-12 10:00. You should read the story before commenting. Submitted by IAmNexusOne on Fri, 2010-11-12 01:41. 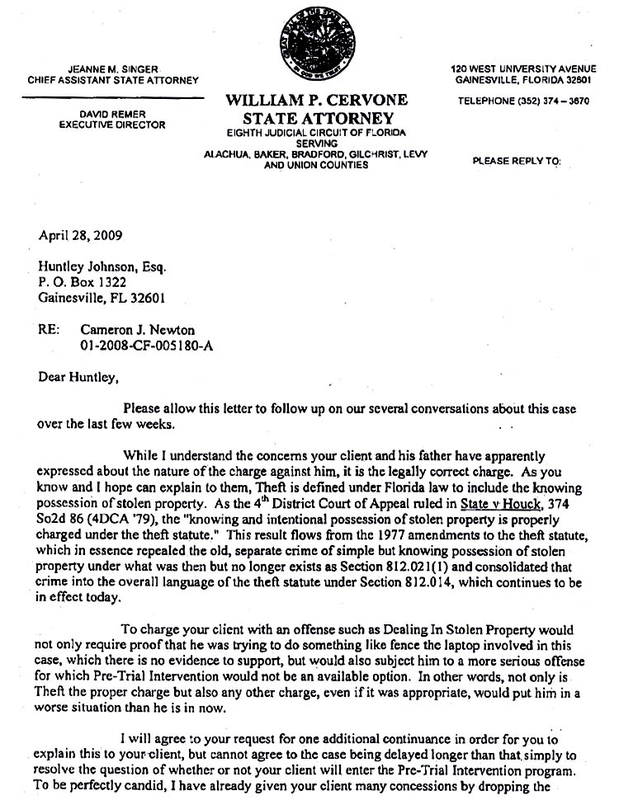 Did you not read the article, the police report, or the letter to his lawyer regarding the charge? The police officer heard Cam admitting to taking the laptop, and to throwing it out the window to avoid being caught by the police. 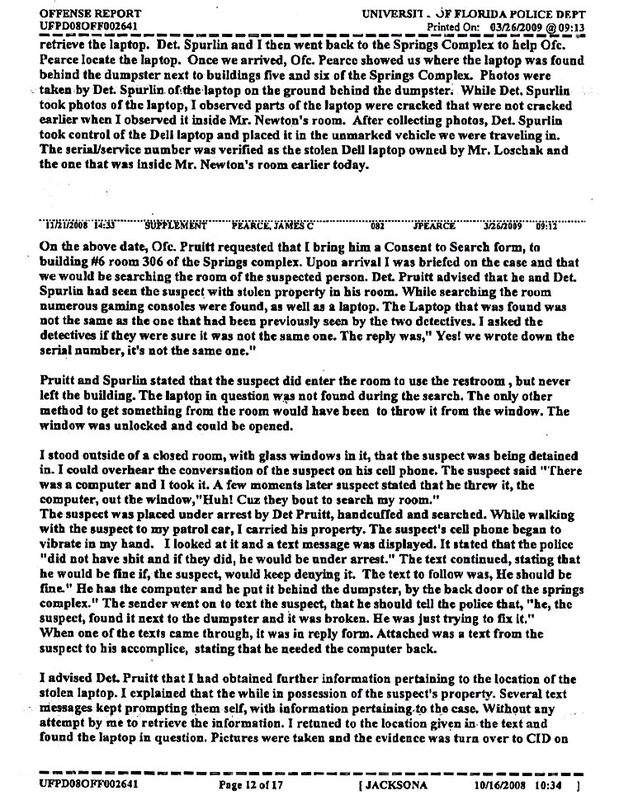 He had a buddy remove the evidence, which was recovered because they were both idiots. 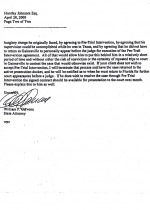 He eventually admitted to the lesser charge of theft in order to avoid going to trial. That has nothing to do with boosters for other schools or any other conspiracy bs. Submitted by spidercat on Wed, 2010-11-10 17:43. Hey man it's the SEC. What did you expect? Submitted by ArtIsStupidDotCom on Wed, 2010-11-10 13:32. Personally, I know of NO ONE who actually looks to a college football player as a role model... for that matter, no football players at all. 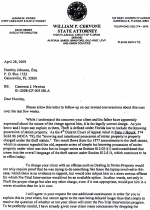 But what really gets me here is a college student who has three different instances of academic cheating to his name, claims of cash solicitation and was arrested in November 2008 and charged with grand theft, burglary, and obstructing justice is getting a college scholarship worth at least 40 K a year. 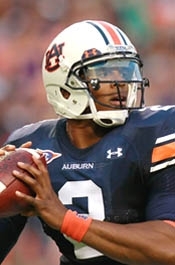 Rather than losing respect for Cameron Newton, which I never have had as I have never even heard of him, I have now lost all respect for Auburn University as a reputable learning center. Submitted by Acacia59 on Fri, 2010-11-12 10:06. College football has been that way for a long time. The T.V. money alone at billions of dollars per year will allow moral decency to be thrown out for the sake of ratings and advertisers. I do believe that college football athletes should be paid like minor league baseball players. We should not however be surprised that Cam Newtons of the world exist in our society. 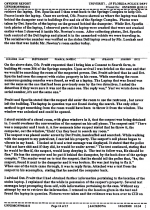 Submitted by G S on Wed, 2010-11-10 10:19. Real great role model. I'm sure the NFL is just salivating at the chance to field this crook along with the animal abuser Michael Vick.